With so many media providers competing for views, some television networks have taken a serious hit in the ratings column. 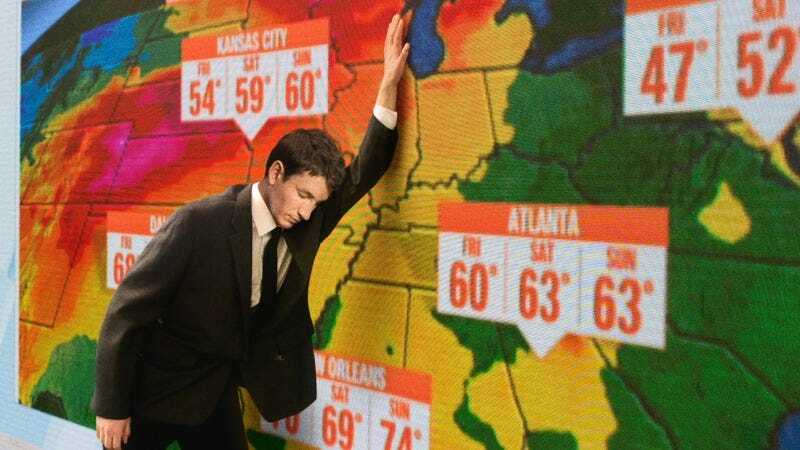 In an effort to get eyes on its content, this local news station has roofied its weatherman just before his segment in the hopes that he’ll commit some kind of viral gaffe. Wow. In the cutthroat world of television, sometimes you’ve got to do whatever it takes to survive. This is make or break. The fate of the entire network depends on this weatherman royally screwing up. With a tweet already drafted that reads, “Our weatherman decided to take a nap at the WORST time!” it’s clear that News 5 Cleveland is ready to capitalize on Finley’s likely loss of consciousness to rack up as many retweets as possible. As Finley takes a final sip of the ginger ale before going live in 10 seconds, all the network can do is hope, and slip some ipecac into the sports anchor’s coffee as a backup plan so that maybe he’ll throw up on air. They’ve done all they can, and now the rest is in God’s hands.